What color were hadrosaurs? 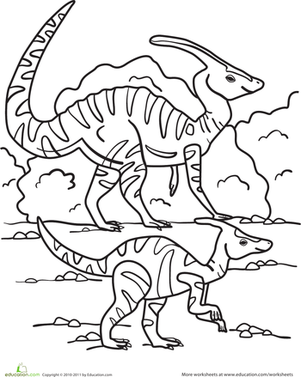 Let your child decide as she colors in this hadrosaur pair in the midst of a midday stroll. Hadrosaurs were herbivores, snacking on leaves and other tasty vegetation. 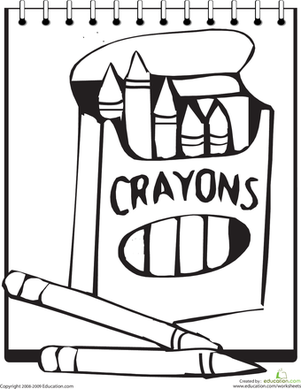 In this coloring page, a crayon box full of crayons has lost its color, and needs your child's help to add color! Color in this picture of a picathartes, a small type of bird that lives in the jungles and rainforests of Africa. This family of kangaroos needs a little color! 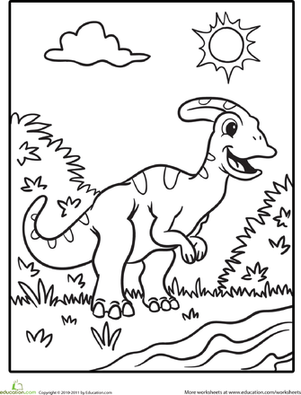 Learn more about these interesting creatures as you color them in. Color in this picture of a fossa, a cat-like animal unique to Madagascar. Color in the frozen desert that we call Antarctica and the animals that live there. The orangutan on this coloring page needs a little more orange to get his day started! Is your child ready to color? Have your child color in the Thanksgiving symbols to help get them in the spirit this November. Have your child color in this picture of a clownfish and friends to help spark her curiosity about underwater life. 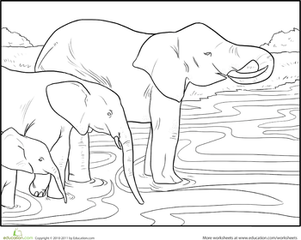 Color a mother elephant leading a younger elephant and her calf into the cool water. Come color the Coendou porcupine on this coloring page. It's like a tree-climbing, tropical cousin of the North American porcupine!